What are the health benefits of these eggs? Can I have chickens where I live? Chesterfield: Up to 6 hens, provided hens are kept within a minimum 10-square-feet structure and at least 25 feet from all property lines. Richmond: Up to 4 hens, no roosters. $60 annual permit fee required. See Richmond's Animal Control website for more information. Henrico County: Hens and roosters allowed without a permit. Proximity, sanitation, noise and zoning restrictions apply. Be sure to check your local ordinances to make sure you can legally enjoy the benefits of raising egg-laying hens. How soon will my hens start laying eggs? Although they were laying eggs before being delivered to your home, they may stop or slow down for a few days while getting adjusted to their new environment. Usually within a week they will laying eggs like before their move. How many eggs per week should we get from the hens? You should expect to get between 8-14 eggs per week from the two hens. Eggs should only be washed right before cooking. The hens leave a natural protective coating, called a bloom, on the eggs to keep them fresh. Eggs can last for weeks without refrigeration as long as they are not washed. However, if an egg is dirty when collected, it should be washed and then stored in the refrigerator for maximum freshness. Do I need to have a rooster for my chickens to lay eggs? Surprisingly, many people don't know the answer to this question. No, you do not need a rooster for your hens to lay eggs. Your hens will make some noise as an egg is laid, but it will not crow like a rooster. How old are the rental hens? The hens that we rent are usually between six months and 2 years old. When treated properly, hens will still be productive egg layers after several years. Can I name the hens? Yes, although they typically won't come when called by their names. They do learn habits though and will get excited and come to you when they see you have some treats for them. What can the chickens eat? Can I give them treats? Chickens can and will eat just about anything. There are some foods though that should not be given to chickens. Keeping a "scraps" bucket in the kitchen to collect scraps before and after your meals is a good way to gather "treats" for the hens. If you like, you can also feed them mealworms available at any pet supply store for a special treat. For a complete list, download the file below. Chickens do not have teeth. They can peck, but it feels mostly like a weak pinch. You can put some treats on your open hand, and they will peck at the treats. You may be startled at first because they move so fast, but once you get used to it, it can be fun to hand feed your hens. I'm going out of town for the weekend. Is there anything special that I need to do? Make sure that their food and water is full when you leave. You can collect the eggs once you return. If you are going to be gone for longer than 3 days, please ask a friend or neighbor to check on their food and water while you are gone. If you let them keep the eggs they find, it usually isn't hard to find someone to check in on your hens while you are away. How can I tell if an egg is good or bad before I crack it open? Place the egg in question into a glass of water. If the egg sinks to the bottom of the glass, it is still good. If it floats to the top or hovers in the middle, it is probably a spoiled egg and should be discarded. Is there any special care that the hens or coop need? We recommend cleaning and moving the coop once a week. The pine shavings that are dirty and the droppings are great for composting. After the first few days, you can let the hens out of the coop for a couple hours each day for supervised free ranging. They will eat up all sorts of pest and fertilize your yard. But watch out for your garden as they enjoy fresh fruits and vegetables! I let my chickens out but now I am having trouble "catching" my hens. What do I do? Don't run after them, because the faster you run, the faster they run. Walk up slowly to them, then swoop down with both hands to grab them. You can always open up their coop door and "herd" them towards the coop. Even if you can't catch them, they will eventually go back into the coop in the evening. Treats in the coop are usually too good to resist for the hens and are another way to entice them to go back into the coop. It is best to start free ranging them in the afternoons before it gets dark as they will be out for a little while then want to go back in on their own. I'm having so much fun with my hens that I want to share the experience. Is there any special referral program? Yes. 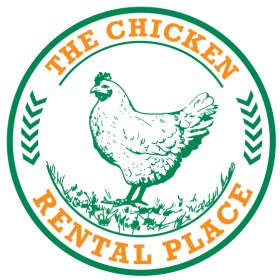 For every friend you refer that rents a coop and hens, you receive a $50 credit off your next rental package the next season. Refer five (5) friends and next year's coop and hen rental is free? (That is a $350 discount!) Maximum credit of 5 referrals per year per customer. Credits cannot be refunded as cash and never receive more than one Rental Season at a time. What if I have some questions or an emergency with the coop or hens?